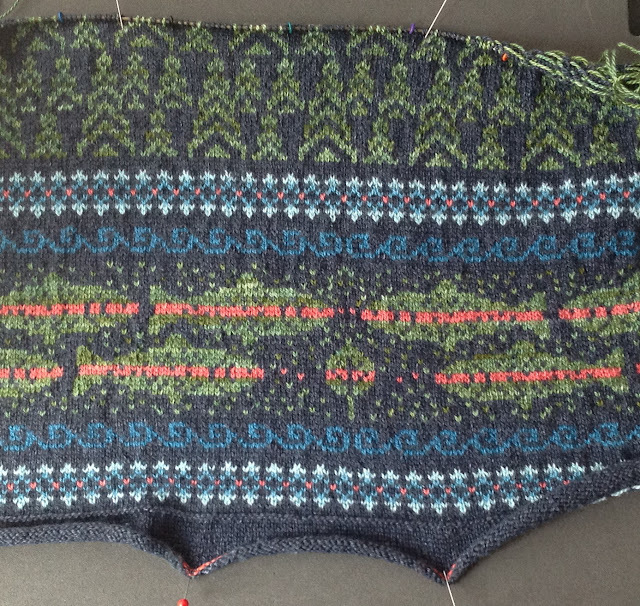 I spent most of the week working on the stranded sweater which was going great until I stood back and looked at trees. I wasn't happy so I recharted them. I like them better now but I did lose a day. The Finishing Class was available on Monday. I got the materials done just in time...Thank you, Carolyn! I will work on Lesson 2 next week. The first lesson covers all types of seams. 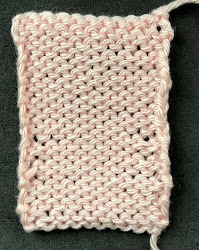 Lesson 2 covers how to pick up stitches and bands. Buttonholes will be in the third lesson. I received quite a few orders for courses. It had been quiet for a few weeks. This week is a continuation of last week's tip, Reading Your Work. This week will be about increases. At the end of the tip, there is a quiz. I will provide the answers next week. I am not going to discuss how to make these increases as I have already done so earlier. If you check the index you can find links to the particular posts. Bar increases are easy to recognize. When you knit into the back of the stitch, it creates hole immediately to the left of the stitch with a bar on top of it. This bar resembles a purl bump. 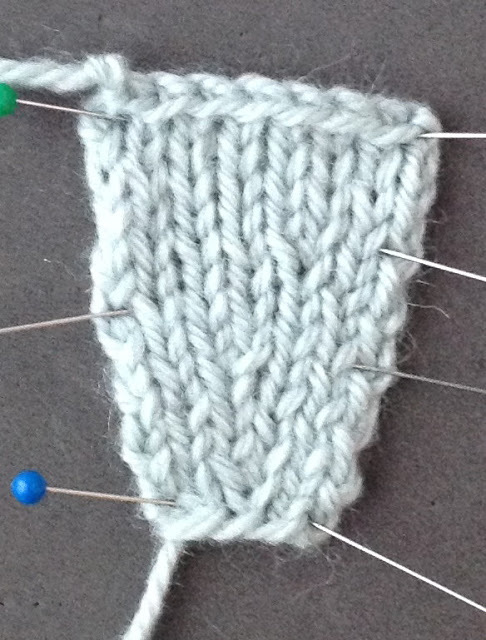 It is a very noticeable increase in stockinette stitch. 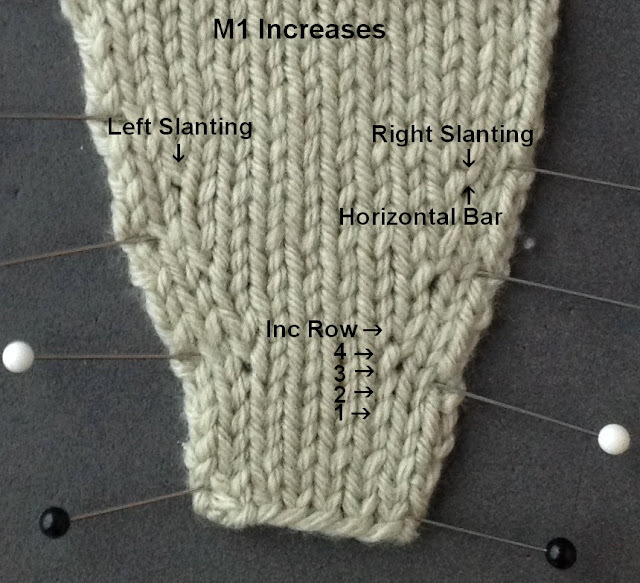 The mistake many knitters make when trying to count rows after an increase is that they assume the row where the purl bump appears is the row where the increase was made. 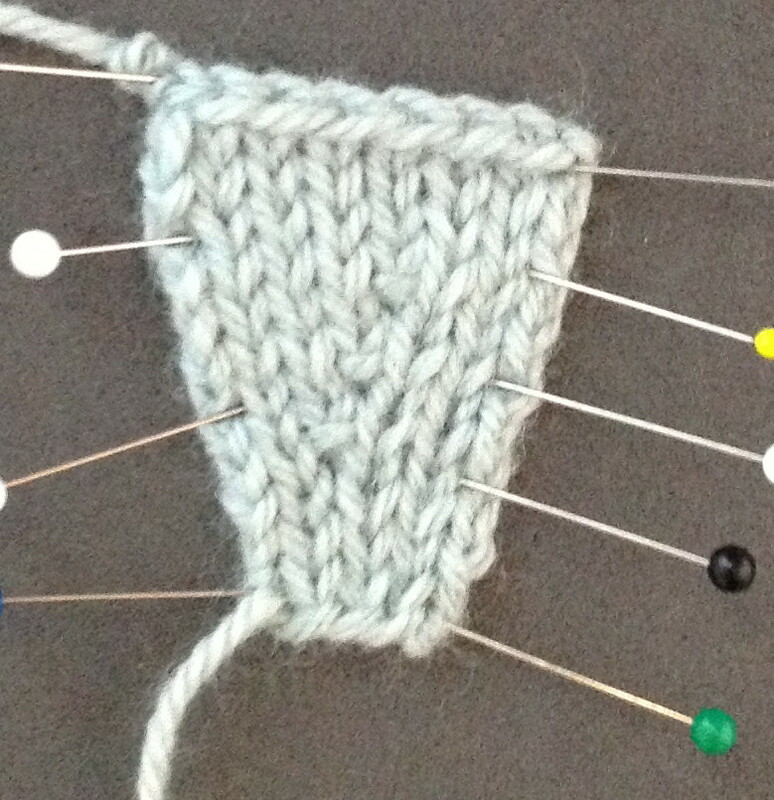 The purl bump is created using the stitches ON the needle when you make the increase. What that means is when you are looking at your work, the row where you see the purl bump is the row BEFORE the increase. It is important to remember this if you are counting rows. I've labeled some rows in the photograph below. In this example the increases are made every other RS row (or every fourth row). When you are using bar increases on the right and left side of a piece, there should be the same number of stitches at the selevedges. 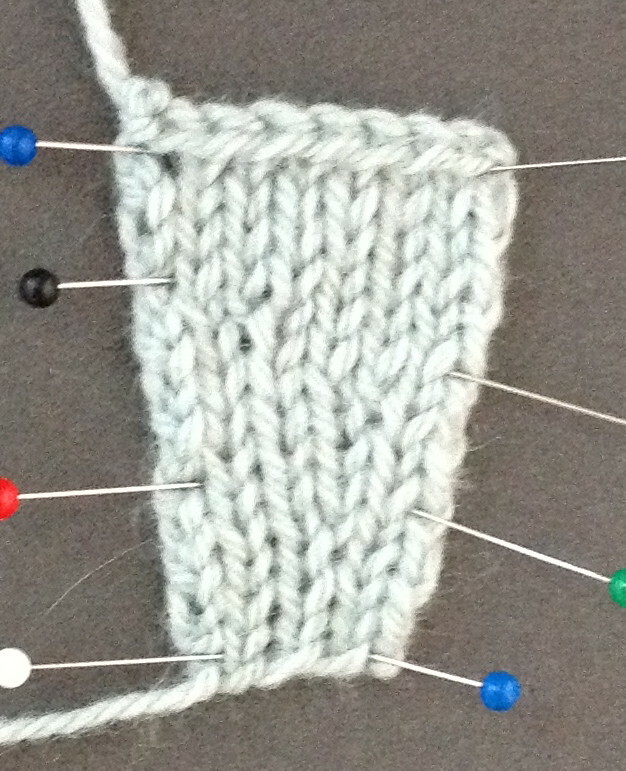 In this example, there are two stitches before the increase on the right and two stitches after the increase at the left. 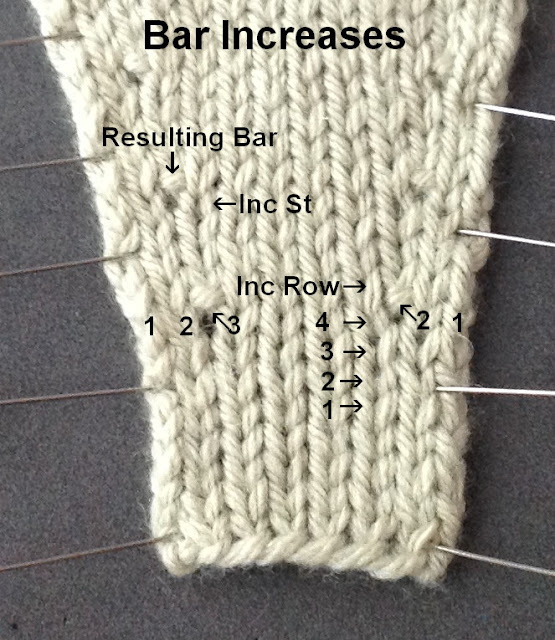 Since a bar increase is made in a stitch, this means that on the right, the increase is made in the second stitch. On the left it is made in the third stitch from the left selvedge. I have labeled this as well. Lifted increases get their name from how they are made. The leg of the stitch below is lifted to make the increase. I am not going to talk about how to make this increase but rather what the finished product looks like. It is a bit trickier to identify lifted increases. (This is actually a good thing since they won't stand out in the work.) If you look at the photograph below you can see that the "lifted" leg elongated. These elongated legs can add an interested decorative detail. As for bar increases it can be confusing to count the rows. I've labeled this in the photograph. The increase row changes the appearance of the stitches in the row below. Like lifted increases, M1 increases slant to the left or right. They are more visible as there is generally a hole at the base of the increase. Since the horizontal strand between the two stitches on the row below is used, it can pull yarn from the stitches on either side. This can make the surrounding stitches smaller. If you are mirroring the increases, work the M1R at the right side and the M1L at the left side. If you look closely at the increases in the photograph, you can see that for the right slanting increases the top leg of the increase slants towards the right. The reverse is true for the ones on the left. Unlike the lifted increases, this is a very subtle difference. I've labeled the rows so that you can see that making the increase changes the appearance of the stitches in the row below. Patterns generally provide instructions for how often to work increases with language like "every RS row" or "every other RS row". Instructions like these are easy to interpret. What can cause confusion is when a pattern states: "every 4th row." Don't count the row where the increase is made. Fourth row (RS)--next increase row. What type of increase is used? How many rows are between the increases? 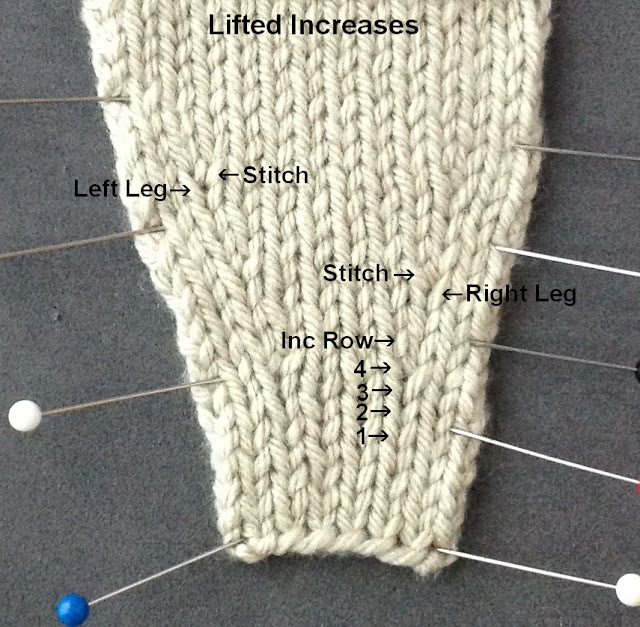 How many stitches on the right side are worked before the increase and how many stitches after the increases are on the left? I will post labeled photographs next week. Salon will be on Saturday from 1:30-3:30. There is a basketball game but not until 9pm. The next opera, Parsifal isn't until next weekend. I spent the week working on the summer sweater. When I swatched the trees I should have paid attention to the trees as well as the color. As soon as I knit the first repeat, I knew I needed to change them. I should have taken a photo before but I didn't. Here it is. I am quite pleased with the results. There is a aspen leaf in the center of the fishes. This is a nod to the next season, fall, which I have already done. It has gold bands to represent the gold of aspen trees in the fall. Knit each row in a different colour. The selevedges will be hideous, but it will be easy to see which stitches were on the needle (R0, pink), which you knit with (R1, pale blue), and the rows between (R2, pale green; R3 lavender). I enjoy this series. It gives me confidence. Wow. Arenda thank you. This is such a detailed post, you must have spent hours on it; knitting the swatches, marking up the photos and writing the text then publishing it. And here I am in my living room in Australia getting personal and free tuition of the highest level. I feel so lucky. Thank you for your hard work. I'm just a beginner knitter and I look forward to reading all your posts over the next few years. A fountain of knowledge!